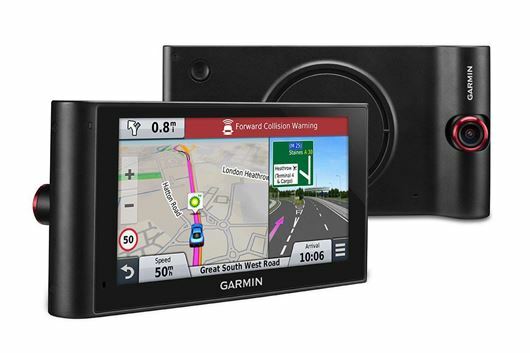 Garmin has introduced a new £300 sat nav system with a built in dash camera. Called the NuviCam it bundles high quality recording and impressive navigation with advanced features, including lane departure warning and a system for helping drivers maintain a safe gap to the car in front. The large, robust unit has a magnetic mounting system, so can be removed and installed easily. The navigation system is familiar from other Garmin units, with the same interface and layout as other devices in the range. ‘Real Directions’ make finding your turn off easier, using landmarks rather than street names to help you navigate. However the big addition is the dash camera functionality. Shooting in wide angle with up to 1080p resolution, the quality gives other mainstream dash cams a run for their money. The camera acts like any other dash camera, recording in short loops and overwriting old footage when the memory card is full. A 4GB card is supplied, but the Garmin NuviCam accepts cards with capacity up to 64GB. Setting the NuviCam apart from other dash cameras is the advanced safety functionality. The camera will monitor the distance to the car in front and give a warning if the gap is too small, plus it will monitor the white lines and emit a warning sound if it detects you drifting out of your lane – though the these features can be turned off if needs be. Other features include smart phone connectivity, allowing you to make handsfree calls and to access some more advanced features, including location-based social media app FourSquare. The NuviCam will be available from Halfords in May, followed by other retailers in June.